Birltey athlete Adrian Bailes clears the famous Gilley Law stream. 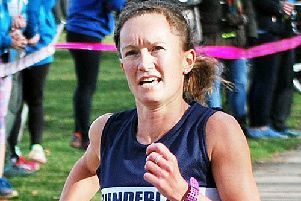 Sunderland Harriers get the cross-country season under way on Saturday when they host their 36th annual event at Farringdon. And this will be the first time it will be known as the Ken Jefferson Memorial Farringdon Cross Country after the esteemed club coach passed away in May, aged 71. He was an ever-present at the relays, being a firm supporter of grassroots athletics. And during its history, he produced many club winners with some going on to win international vests. The six events on the programme cater for all age groups from under-11s to veterans, with the senior men’s and veterans’ four-stage relay being the highlight of the afternoon’s proceedings. And for the second year, the women are catered for with their own three-stage relay which replaced their scratch race. The Wearsiders have the proud boast of staging the longest-running club open cross-country event in the North East. It is the ideal event for clubs to prepare their athletes for the forthcoming season, with the first Harrier League race at Wrekenton just around the corner on Saturday, September 29. With the event in Ken’s name, the club is going all out in ensuring that they have a good turnout and that the teams will be strong enough to contest a place in the frame. Club captain Nathan Reed said: “I am hoping we can have four complete teams in the men’s relay. We want to win and have a good show in numbers as it is the first year the race is named in honour of Ken. Reed’s A team has Mark Smith, Kevin Jeffress, Ian Ritchie and Steve McMahon in the line-up. The B team sees Sean Mackie, Steven Duffy, Joe Pomfret and Reed himself, down to run. The veteran men’s team could look like this: Ian Dixon, Paul Blakie, Rob Walker and Michael Thompson. The Sunderland women’s team were the best-placed of all Sunderland teams last year in finishing fourth. They were Alice Smith, Vikki Cotton and Coleen Compson. Alice Smith is back again with Eve Quinn and Jenna Wilkinson joining her this time. The B team is Michelle Avery, Colleen Compson and Lauren Flaxen. The veterans’ A team is Vikki Cotton, Catherine Morris and Bev Martin. As well as the two relays over four legs of 3000m, there are races over the same distance for all the other age groups. But the under-11s compete over 1,000m and this is the first race on the programme at 11.00. The popular course has been adopted by many as their favourite and is classed as a true cross country venue with its mixture of hills, flat sections, woodland, hills and the famous Gilley Law stream to negotiate. Timetable: 11.00 - Under-11 Boys and Girls: 1000m, 11.15 - Under-13 Boys and Girls: 1.8 miles, 11.30 – Under-15 Boys and Girls: 1.8 miles, 11.45 - Under-17 Men and Women: 1.8 miles, 12.00 - Senior Women and Veterans Relay: 3x1.8m, 12.45 - Senior Mens and Veterans Relay: 4x1.8m. Three Sunderland Harriers won gold medals in the British Masters’ Track and Field Championships at Birmingham. Nicola Woodward chopped a massive 10 seconds off her previous best to win the Over-40 800m in 2.21.94. She is now ranked eighth in the UK in her category. Vicky Haswell also recorded a PB, going under 2.30 for the first time with her clocking of 2.29.75. She now jumps to 16th in the UK rankings. The third winner in the royal blue vests was Jacqueline Etherington who won the 2000m steeplechase in 7.47.58, just 0.03secs off her PB. All three athletes now travel to Malaga to compete in the World Masters’ Championships early next month.